Small Business BC is British Columbia’s premiere resource centre for knowledge-based business products and services. Though we’re located in Vancouver’s Waterfront Station, entrepreneurs around the province have made use of our services by attending one of our Popups in their community. No matter what stage of business you’re at, you probably have questions. And our team has the answers. Our free Popups give you the opportunity to learn the key steps in the business startup and growth process and introduce the support services available to you. The popup’s are where we popup in a remote location to provide an opportunity for individuals to ask any business questions in person. We do not follow a formal structure for our popup’s, you are welcome to pop by between the popup hours and we will be happy to help. Looking for more one on one support? We also offer FREE 15-20-minute consultations upon availability. 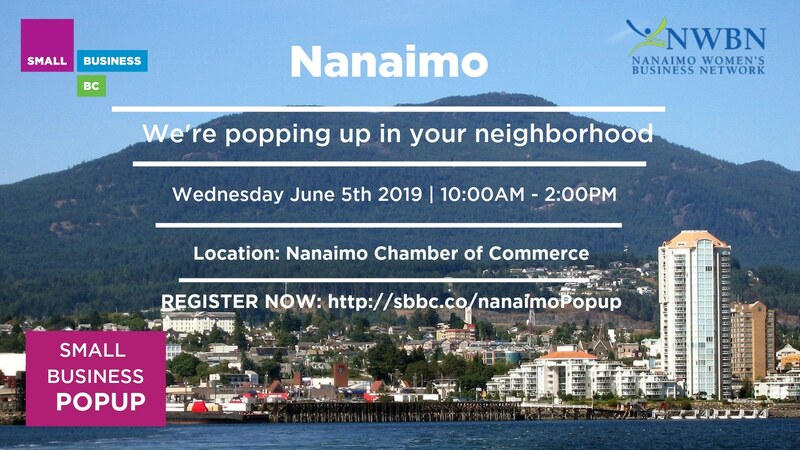 This June, we’re visiting the beautiful seaside community of Nanaimo for a FREE one-day Popup at the Nanaimo Chamber of Commerce alongside our partners from Nanaimo Women’s Business Network. Meet with a Small Business BC Advisor for a free, 20 minute, private consultation. Learn the key steps of a business startup and growth process and find out about the support services available through Small Business BC. These sessions support an open flow of questions and a safe environment to learn the foundations of starting a business. Not located near any of our upcoming Popups? No problem! We’re always on the lookout for our next venue to visit. Hosting Small Business BC in your area brings a number of amazing benefits to your local entrepreneurial community. An educated small business is a resilient small business. We will share our content and resources with your community. We will bring a small business advisor to you community, who will be available for one-on-one consultations. Have businesses with a special interest in import/export, market research or business planning? Let us know and we can bring the right expert. Small business is the backbone of the BC economy, generating approximately 34% of provincial Gross Domestic Product. Hosting Small Business BC in your community will help show your support to these businesses. Want us to visit your community? Click Here for more information.